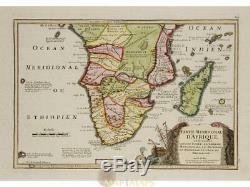 Africa Kingdoms old map Meridionale D'Afrique by De Fer 1703. Title: Partie Meridionale D'Afrique ou se trouvent La Bass Buinee, La Caferie, Le Monomotapa, Le Monoemugi, Le Zanguebar, et L'Isle De Madagascar. Antique map of the Kingdoms of South Africa and Madagascar with describing the discovery of the Cape by Bartholomew Diaz in 1486. The map is copperplate engraved with hand coloring, mile scale and title cartouche with sea monster and box with C. Nicolas De Fer was the official geographer to the French king and a successful publisher. The son of cartographer Antoine de Fer. Nicholas was established as an engraver, cartographer and map publisher in Paris. Nicolas began his career with an apprenticeship to the engraver Louis Spirinx in Paris. After his death in 1720 De Fers property was divided between his sons-in-law Guillaume Danet, François Bénard and Rémi Richer. Origin: L'Atlas Curieux ou Le Monde Représenté dans des Cartes Générales et Particulières du Ciel et de la Térre. 16th -17th -18th-19th Century maps & atlases & prints. We sell guaranteed Absolutely Original authentic Maps and Prints. 15 x 10.25 inches. 12.5 x 8.25 inches. 31.5 x 21.5 cm Condition: Fine hand colored engraving in very good condition. All maps and prints are genuine, authentic, published at the date stated in this listing! All maps and prints are genuine, authentic, published at the date stated above. 3 day's Global Express Courier Services on request. The item "Africa Kingdoms old map Meridionale D'Afrique by De Fer 1703" is in sale since Monday, January 28, 2019. This item is in the category "Antiques\Maps, Atlases & Globes\Africa Maps". The seller is "mapandmaps" and is located in Europe. This item can be shipped worldwide.